The Porter Yett facility, source of asphalt nuisance odors in Cully, is installing a Blue Smoke reduction device. This may solve the odor problems. In the meantime, please remember to file complaints with DEQ at 1-888-997-7888. Complaints will allow DEQ to gauge the effectiveness or ineffectiveness of the new equipment. CAAT is working with Neighbors for Clean Air and PSU to install four ambient metal air monitors in Cully. The monitors are sited in Cully neighbors yards. Thank you to those Cully residents! The monitors will test for metals in our airshed, such as lead particles from Owens-Illinois Glass recycling. Findings will be analyzed by PSU graduate students under the direction of Dr. Linda George, at PSU. We expect data and results in late 2017. DEQ will also site a full-air toxics (including VOC’s) monitors in winter 2017-18. Cleaner Air Oregon (CAO), the statewide shift in how Oregon deals with air pollutants, suffered a setback in the 2017 legislative session. But, it is still moving forward due to an increased awareness and understanding of public health concerns. The setback regards funding DEQ’s implementation of CAO at the state level. One additional area of concern being debated currently regards an increase in the number of cancer deaths allowed in a population living near new and existing polluters. CAAT, and other grassroots organizations, are pressuring DEQ to not make this change, called ‘Risk Action Levels’, in Cleaner Air Oregon legislation. Cancer death levels should be decreased, not increased. Please contact your State Representatives, and Governor Brown, and tell them to decrease the ‘Risk Action Levels’, not increase them. The burden here is on the public, for cancers, other pollution related illnesses, and for paying for treatments. Polluting industries must use the best technology available to move towards zero toxic emissions. 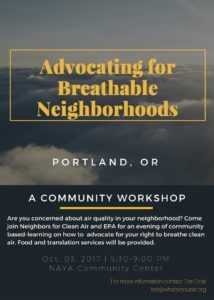 Neighbors for Clean Air is hosting a community workshop on effective air advocacy and public comments from 5:30-9 p.m. at the NAYA Cafetorium (5135 NE Columbia Blvd, Portland, OR 97218) on Tuesday, October 3rd. We will be providing dinner, translation services, and childcare for all attendees. Cully’s own CAAT, cullycleanair.org, will be there, as well.